This is a lighter, less sugar- and fruit-heavy version of a previous cake I posted here. 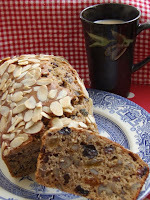 It uses golden syrup instead of treacle and gives a nice light-coloured, sweet loaf. Spread with vegan marg - the way we Irish eat brack - or eat plain with a hot cup of tea. Lovely! o Heat the soya milk and the golden syrup gently until they are thoroughly combined, but be careful not to over heat. o Bake for an hour and ten minutes in the top of the oven.